Am i completely insane or does anyone else find the idea of this adorable..i mean how could you ever be miserable living here? 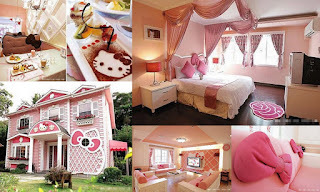 I thought Minnie mouses house in Disney was good but this takes the hello kitty shaped biscuit!!! 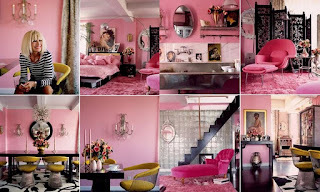 After finding this i decided to search more pink houses etc..yep i know very bored right?! And wow i loooove betsy johnsons pad..i love her fashion line and now her house! Maybe this is a more realistic and mature dream to have!! I don't think your insane!! Wow - i wonder who lives in the cute hello kitty house!! I love all things pink... I was so so so tempted to buy a baby pink car but my parents, bf and friends said they wouldnt be getting in the car so i would be very lonely in my new pretty car hehe!! I love Betsey Johnsons place, I saw that a long time ago and I told my bf that when we have a house I want a vanity room and it'd look like that. He said it was creepy.